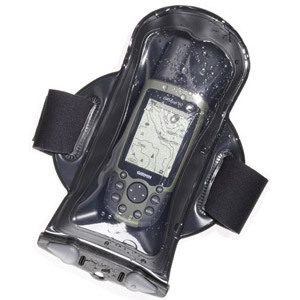 Waterproof GPS Units & Waterproof Radios. The Aquapac large armband waterproof phone case offers guaranteed protection for your waterproof phone, waterproof GPS unit or waterproof radio. All Aquapac waterproof phone cases have been tested by the British Standards Institute. Aquapacs waterproof phone cases have the markets lowest warranty return rate. Moreover Aquapac guarantee if the waterproof phone case fails they will compensate you for the contents, as well as for the case. Moreover the warranty lasts for 3 years. The Aquapac Large Armband Case (Code 212) fits larger phones, larger type GPS units and handheld radios. The unit is generic sized case that allows larger phones to fit easily. It allows for operation of the phone interface through the clear case screen and also allows access to phone sound. This waterproof GPS case is popular with all types of small watercraft to help them locate their postion at sea. When your out at sea the GPS on your arm can confirm exactly where the inlet that can’t be seen from land is. An Armband allowing you to strap the case to your arm or your equipment so you can enjoy your activity hands free. An adjustable neck cord so you can also tie the case to your equipment or just hang it on your shoulder. The Aquapac 3-year global warranty. The Large Armband Case (code 212) fits large phones as well as the larger older model GPS units or handheld radios. To make sure you choose the right case check out our Size Guide. Maximum size of equipment to fit in case. The elastic and Velcro® armband that comes with the case is 37cm/14.6 inches long.